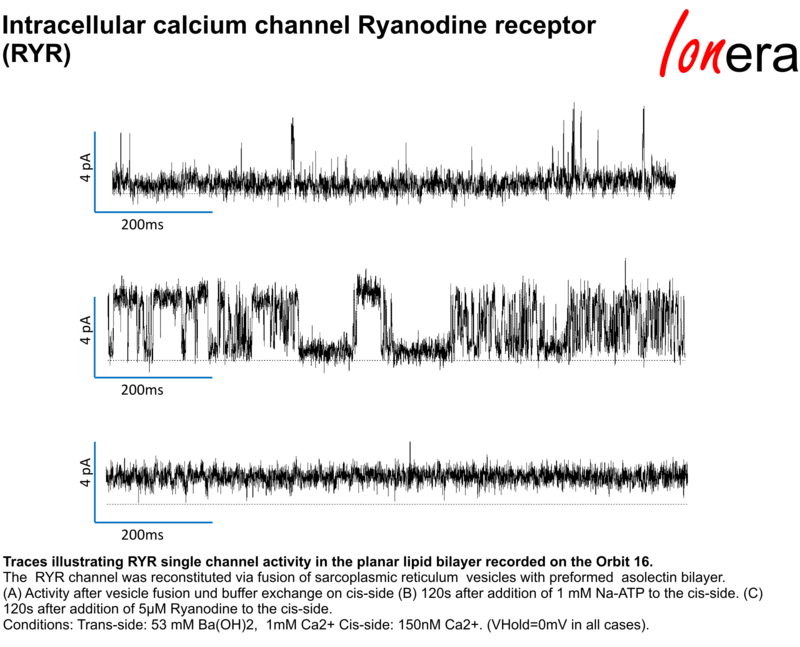 Ionera's MECA products have successfully been used to study a whole range of channel forming entities. 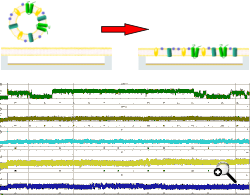 Our MECA technology combines a reliable and simple membrane formation with the flexibility to employ all common reconstitution techniques. For examples of amphiphilic molecules used for membrane formation see here. 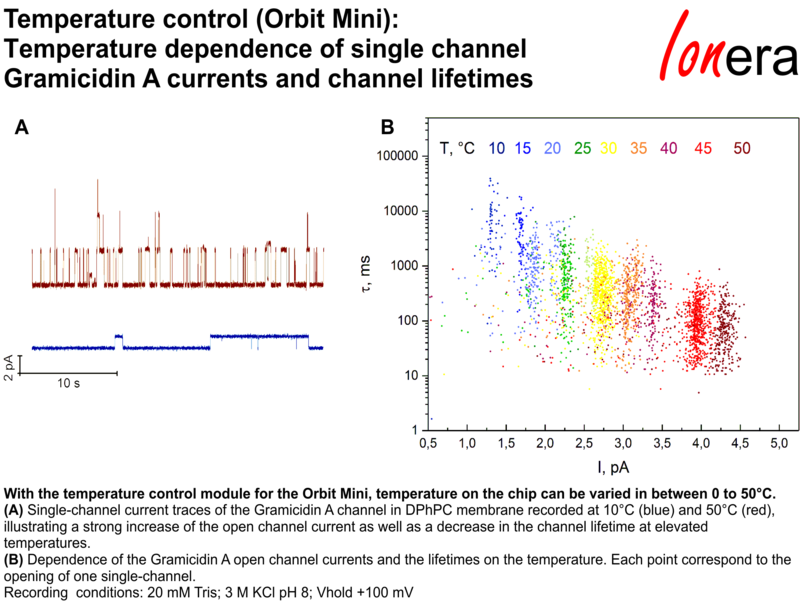 Temperature dependencies of pore activity can now be precisely measured with the Temperature Control Module for the Orbit Mini. MECA users get high quality in a fast and reliable manner! Some bacterial toxins, antibiotics and other membrane active peptides can self-insert into lipid bilayers. 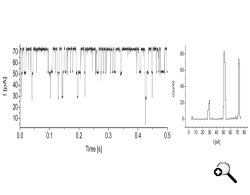 Controlled membrane incorporation can be achieved via optimization of the protein concentration and facilitating spontaneous insertion with short voltage pulses. 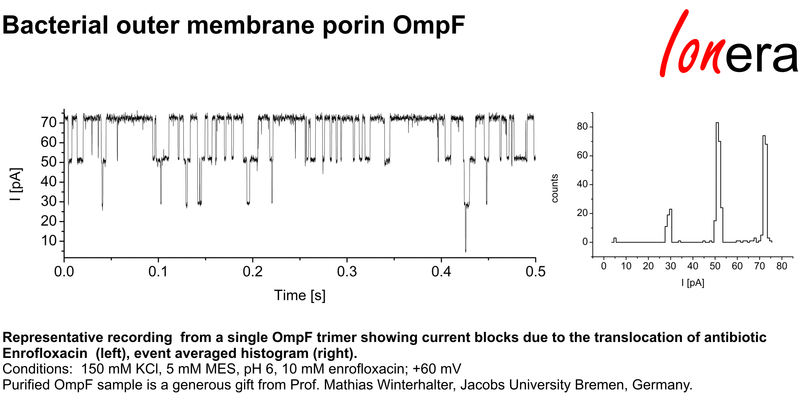 Screenshot of a recording window of a typical Gramicidin ion channel forming activity assay on the Orbit 16. 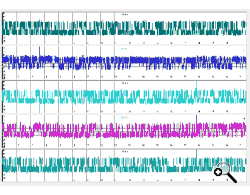 Screenshot of the recording window showing simultaneous and parallel PEG detection with single aHL-nanopores. 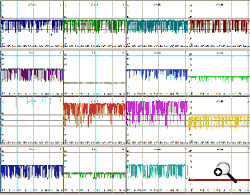 Channels 1-5,7,12-14 contain a single aHL-nanopore. 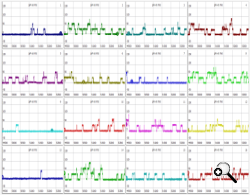 Channels 10 and 11 have two and Channel 9 has three aHL-nanopores. 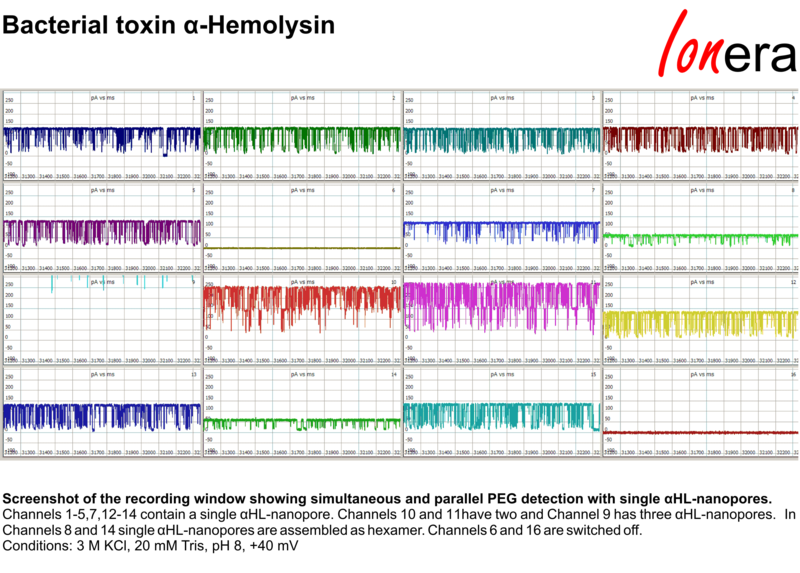 In Channels 8 and 14 single aHL-nanopores are assembled as hexamer. Channels 6 and 16 are switched off. 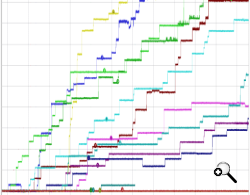 Temperature dependencies of pore activity can now be precisely measured on the Orbit Mini. 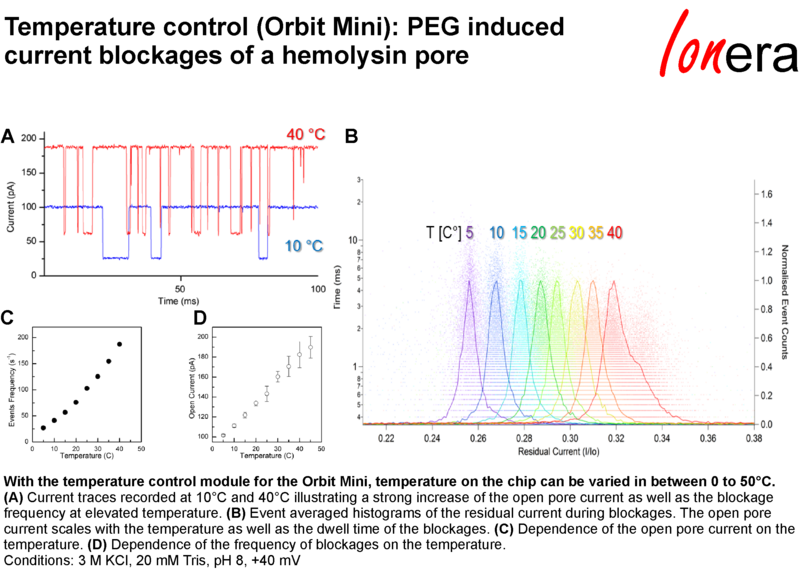 With the temperature control module, temperature on the MECA chip can be varied in between 0 to 50 deg C.
Temperature dependence of PEG induced current blockages of an a-hemolysin pore. 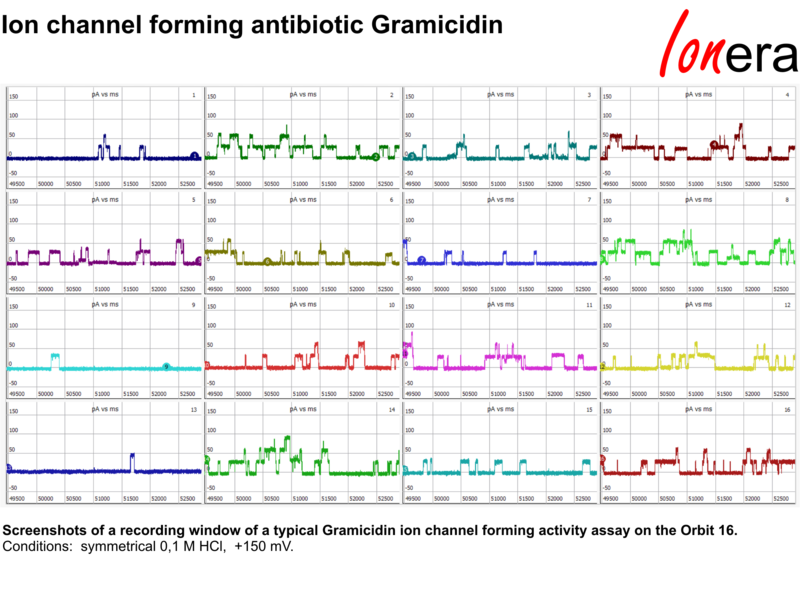 Temperature dependence of single channel Gramicidin A currents and channel lifetimes. Beta-barrel membrane proteins, such as bacterial porins solubilized in non-ionic detergents can be directly incorporated into a bilayer array from detergent micelles. 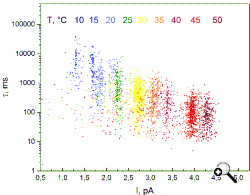 Predilution of the purified protein sample in detergent in concentration close to the detergents CMC followed by rapid dilution into the recording chamber results in incorporation of proteins into membranes. Concentration of the protein stock solution and dilution factor must be optimized to improve the rate of single channel insertions and minimize influence of the detergent on the membrane. 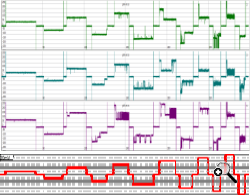 Screenshot of the recording window showing simultaneous and parallel assay of channel-forming activity and single-channel conductance of recombinant MspA mutant porin in a diphytanoyl phosphatidylcholine bilayer derived in 1 experimental run with the Orbit 16. 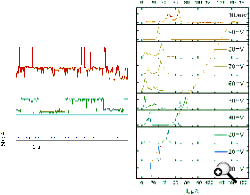 Representative recording from a single OmpF trimer showing current blocks due to the translocation of antibiotic Enrofloxacin, event averaged histogram. 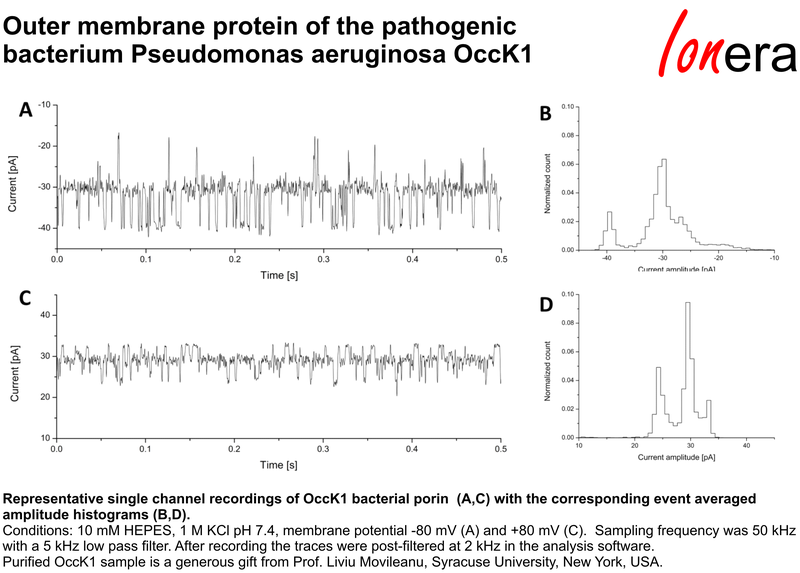 Representative single channel recordings of OccK1 bacterial porin (A,C) with the corresponding event averaged amplitude histograms (B,D). 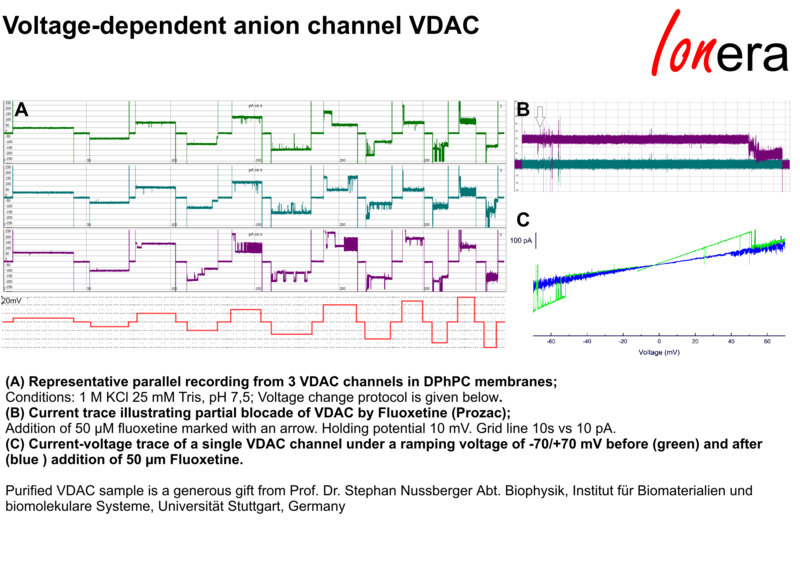 Current recordings of single VDA channels from selected bilayers in parallel. VDAC was reconstituted in DPhPC membranes and partially blocked upon the addition of Fluoxetine (Prozac). 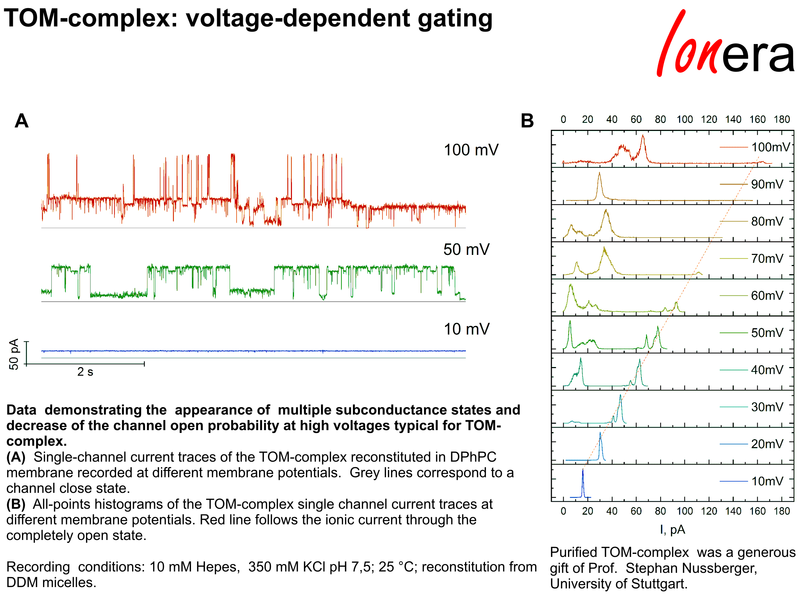 Single-channel current traces of the reconstituted TOM-complex together with the all-points histograms recorded at different membrane potentials. 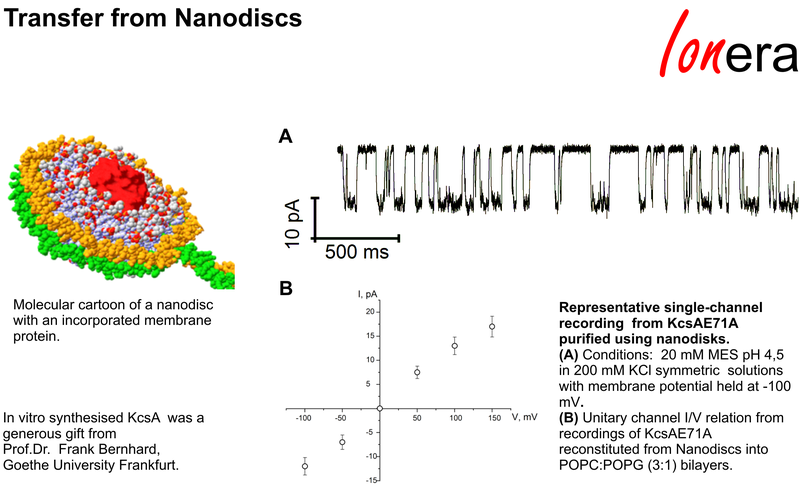 For electrophysiological recordings ion channels may be reconstituted from unilamellar proteoliposomes or native membrane vesicles which are fused with the planar bilayers. 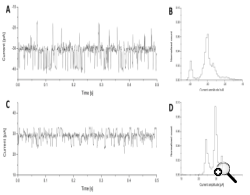 Osmotically induced swelling of the proteoliposomes or native membrane vesicles in immediate proximity of the lipid bilayer, as well as presence of charged lipids facilitate the protein incorporation. 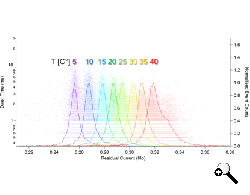 Single channel currents of tetrameric potassium channel KcsA E71A recorded from 5 selected bilayers in parallel. KcsA was expressed in vitro with its co-translational integration into liposoms containing asolectin lipids. The proteoliposomes were subsecuently fused with bilayer array containing POPE/POPG on the Orbit 16. 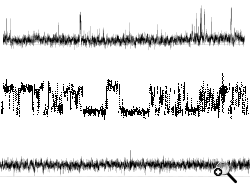 Traces illustrating RYR single channel activity in the planar lipid bilayer recorded on the Orbit 16. The RYR channel was reconstituted via fusion of sarcoplasmic reticulum vesicles with preformed asolectin bilayer. 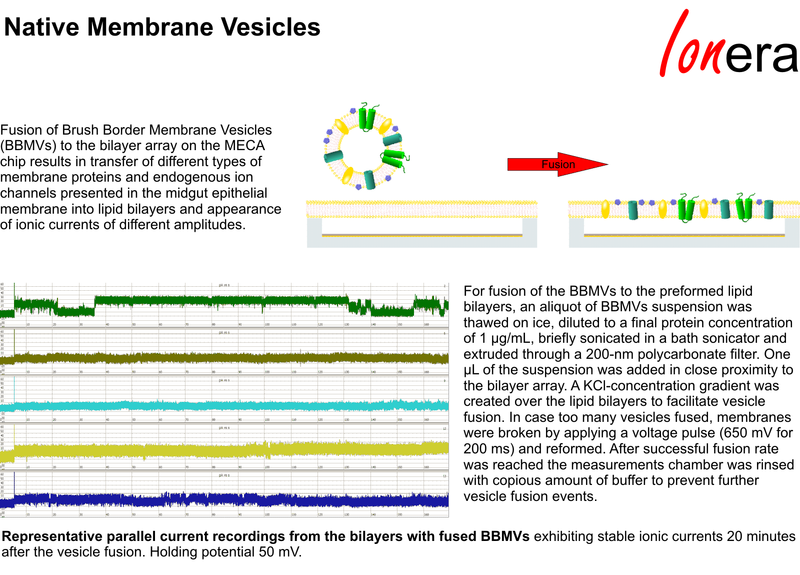 Representative parallel current recordings from the bilayers with fused BBMVs showing different activity of endogenous ion channels presented in the midgut epithelial membrane. 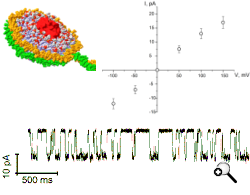 Ion channels can be transferred from nanodiscs into lipid bilayers on the MECA chip. 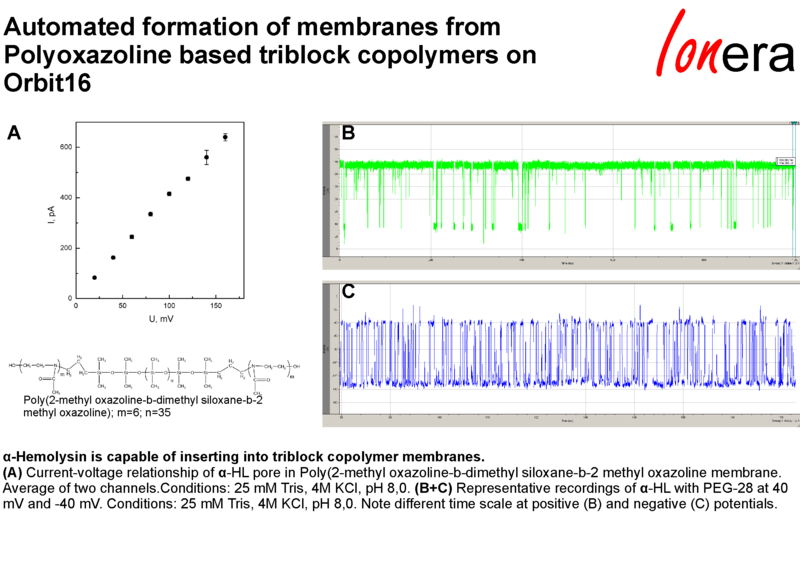 Representative single-channel current recording from KcsA purified and reconstituted using nanodiscs. On the MECA chips, membranes can be repeatedly formed using different lipids and lipid mixtures as well as tailor-made amphiphilic polymers. 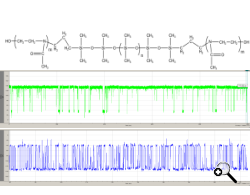 Screenshot of a recording of alpha-hemolysine in a polyoxazoline based triblock copolymer membrane on the Orbit 16. 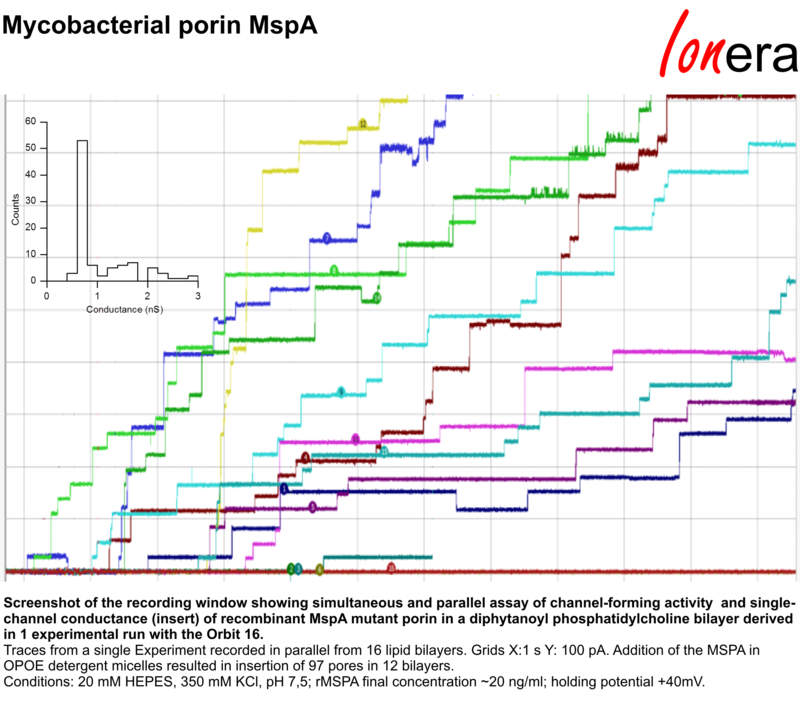 We have used and tested various lipids and lipid mixtures for bilayer formation on the MECA4 and MECA16 chips.